Here is a Smilebox show of Valerie C. White’s studio and some of her quilts presented by The Quilt Show. This juried exhibition will showcase a selection of textile work, complementing the rich history of textiles in New England with the dynamic expression of current textile design. 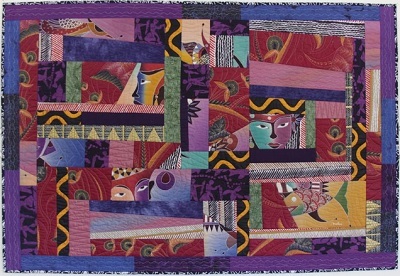 There is a new exhibit at New Britain Museum of American Art: Let Me Quilt One More Day, through January 4, 2015. The exhibit showcases the history of the artistic practices, reinterpretations, and innovations of quilt making. More than forty historical and contemporary quilts ranging from traditional to modern designs are in this exhibit. This is an Smilebox online slide show presented by The Quilt Show of wearable art from Pacific International Quilt Festival 2014. This fiber art and mixed-media invitational exhibition will feature renowned New England artists from Vermont, Maine, New Hampshire, and Connecticut. You are currently viewing the archives for November, 2014 at Woodhaven Studio's Weblog.